Salomon's damp-and-quick Czar delivers a powder ride so irresistibly smooth, just one run might well turn you into a wandering deep snow nomad for life. So I warn you now: if you don't want to be forever haunted by memories of effortless best-day-of-your-life untracked snow billowing up around you, you might just want to stick to your present powder plank on the deep days rather than risk giving the Czar a try. The Czar, to my mind, is a strong contender for the ultimate in-bounds powder ski—whatever you throw at it, it makes much, much better. Of course the Czar is brilliant when the snow is light, deep, and untracked, but really, so is just about anything. I recently skied a 72mm-waisted ski on Secret Peak in flawless deep backcountry snow and couldn't have been happier. But let's talk for a moment about what happens in-bounds on a bluebird powder morning: you're basically racing a peloton of other skiers all hell-bent on finding the fresh and annihilating it. For most of us, that means linking up an ever-diminishing series of untracked-but-short pitches that typically don't last much past 10:00 a.m. For the rest of the day, you'll be contending with a considerable amount of chop, remnants of the mad dash for first tracks over every square inch of the hill. Chop was specifically what drew me to the Czar. I was having trouble with tip deflection using my Volkl Gotamas during a series of intense storms at Snowbird—for my 145lb body weight, the Gotama's traditional sidecut paired with fat ski dimensions made for an unruly ride in uneven snow. The narrower, slightly spear-shaped tip of the Czar looked promising in comparison. On snow, I was delighted by the way the Czar's tip sliced through chopped up powder without deflecting off to the side (as the Gotama's did). The Czar was clearly superior in chop—but that was only the beginning of the story. Provided you are skiing powder or soft snow, the rockered Czar is a very versatile ski. It is well-mannered, and it tends to do whatever you ask of it: smear turns, upright turns, forward balance, backseat, whatever. I was particularly captivated by the Czar's unexpected prowess on steeps. The Czar's rockered profile seems almost custom-designed to let you bang off effortless European-style pedal turns on high angle terrain. Who would have ever expected that? The direct result of all this versatility and balance is confidence. I found myself repeatedly leaving trails for trees, aggressively pushing down steep chutes, and diving fearlessly into chop knowing the ski would back me up. The Czar will absolutely let you go longer and harder than you're accustomed to in conditions that would otherwise crush your legs. It's as if the ski smooths out the hill, delivering a ride that is remarkably damp yet somehow also quick and lively. This pairing of quickness and dampness makes for an extraordinarily memorable ride. I was so taken with the Czar I knew I'd be buying a pair within my first few turns on it. 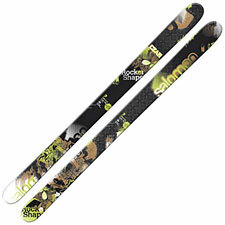 Be aware that this review applies to the 2010-2011 ski, and not earlier models, which are substantially different. Be aware also that compared to a more traditional ski (like the Gotama) on hard snow, the Czar is quickly outclassed. It is a powder specialist, to be sure, but on powder, you won't want to ride anything else.